The acclaimed independent black comedy is going Blu this September. 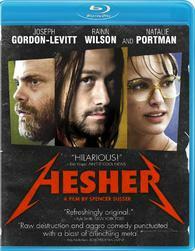 In an early announcement to retailers, Lionsgate says 'Hesher' is coming to Blu-ray on September 13. Joseph Gordon-Levitt ('Inception') leads the dark comedy in the title role, an unconventional loner who is more interested in pyromania than finding a job. Also starring Rainn Wilson (TV's "The Office"), Devon Brochu ('In the Valley of Elah') and Oscar® winner Natalie Portman (Best Performance by an Actress in a Leading Role, 'Black Swan'), this dark comedy meets fairy tale was a film festival favorite - an Official Selection of South by Southwest, and nominated for the Grand Jury Prize at Sundance in 2010. Hailed as a "delectably anarchic black comedy...refreshingly original" (New York Post), the film features the music of Metallica. Specs have yet to be revealed, but supplements include deleted scenes, outtakes, cast and crew interviews, a sketch gallery. You can find the latest specs for 'Hesher' linked from our Blu-ray Release Schedule, where it's indexed under September 13.